Showcasing the height of new luxury construction in some of the world’s most sought after locations, let’s explore an exclusive new developmentfrom our worldwide network. There is nowhere quite like the Sapphire Residences – an exquisite collection of apartments and penthouses boasting uninterrupted panoramic views overlooking the Indian Ocean and the Beira Lake. Inspired by the famous Sri Lankan blue jewel, Sapphire Residences has been meticulously designed for those who expect the best things in life. 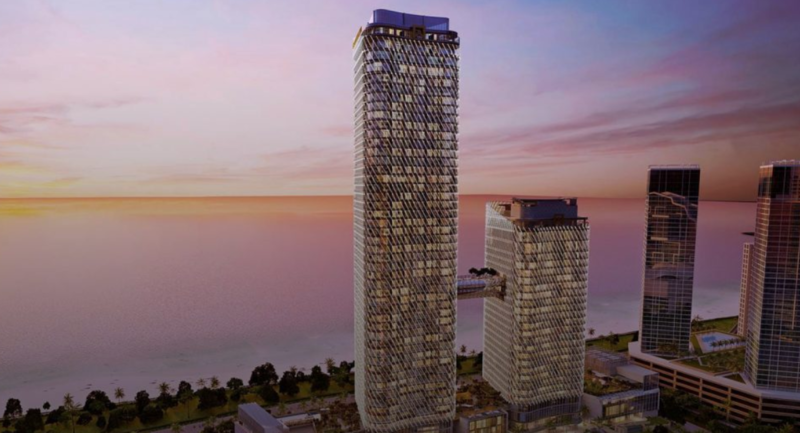 Towering 50 floors above the city, Sapphire Residences is a collection of 132 magnificent private residences that provide the best that modern living has to offer. In addition to over 40,000 square-feet of world-class leisure facilities, residents will have access to retail and office spaces, as well as many hotel and concierge services and amenities. The penthouses offer an exceptional level of elevated accommodation, especially for larger families – or indeed for those who simply desire abundant space to relax, live and entertain. Rising majestically between the ocean on one side and Beira Lake on the other, this new residential development awaits the arrival of the world’s most discerning residents. These magnificent homes echo the true spirit of vertical living, built on a heightened level of luxury, comfort, security and privacy for the entire family. The residences are a fusion of Phillipe Starck’s multi-faceted interior design talents, uniquely combining elements from the past and the future as only he can. Learn more about the Sapphire Residences. From the azure waters of the Caribbean and the Mediterranean, to the bustling metropolises of Dubai, New York, and Chicago, discover incredible New Developments around the world. When it comes to rural escapes, it can be easy to be pulled in several directions at once. A cabin in the woods, or an escape by the sea? The timelessness of a log cabin or the bright refinement of an English country cottage? Whatever your aesthetic, you’re sure to find a detail to suit your taste from these two approaches to the weekend retreat—whether you’re leaving home on an adventure or bringing fresh design to your existing space and staying put. Farmhouse kitchens, whimsical gardens, and crisp whites are the hallmarks of the country cottage. A bright, light-filled sitting room, a stone-and-shingle home in Connecticut—these are the fertile grounds where cottage living is perfected. Bring this style into your everyday with plush reading chairs, recreation fixtures and appliances, and oceanic blues as an accent. No matter how far you reside from the countryside, these touches create comfort to unwind in—wherever you may be. If the decorous calm of cottage life is not quite for you, look to the rugged coziness of cabins instead. Here, think Muskoka and Colorado, ski chalets and pioneer homes. While exposed beams and ample paneling is conventional cabin décor, elevate this style with contrasting stonework and rich textures. The traditional cabin is small, but today’s iterations are bespoke and polished. Outfit even your weekday residence with the trappings of forest expedition—live edge woods, antlers, warm layers—and you’ll be able to feel remote wherever you are. It’s possible to capture the romance of mountains, the mystery of the sea, and the allure of the rolling hills through a handful of purposeful design decisions. Collect your books and blankets, paint a room a pristine white, bring in some warm wood paneling, and see where your cabin and cottage remodel takes you. Browse these cottages and cabins, and source your next vacation property from the comfort of your weekday home. Whether you’ve always dreamed of owning a vineyard or have only recently considered making one your home, there are many benefits to living and working among the vines. From European-style estates in California to a historic homestead in South Africa to a West Coast–style winery in Canada, there is no shortage of opportunities to make the dream a reality. Owning a vineyard is not only about running a business or winning acclaim—though those things are a major plus—it also offers a host of unexpected upsides. So whether you’re an enthusiast looking to bottle the next award-winning merlot, a hobbyist in pursuit of a weekend fascination, or a casual browser on the hunt for an idyllic vacation property, vineyard ownership is an adventure waiting to be discovered. There are places in the world that inspire you immediately upon arrival. A vineyard is one of these places: the rolling hills and budding vines connote romance and tranquility. Transport yourself to the South of France or the hills of Tuscany with a vineyard that works overtime on inspiring views. This elegantly-designed home in California’s Bay Area is an example of such a place. The estate is bounded by roughly four acres of vineyards. Open up the living room’s French doors and lose yourself in the lush vines on all sides. Plus, there’s nothing quite like the golden glow of the sun setting on the grape leaves in the distance. Whether you plan to be your own winemaker or to hire one, the joy of working outside among the grapes and vines is unmatched. Getting to know the landscape around your vineyard and taking part in the harvesting process can be an incredibly rewarding experience. Leave the office for the hillside, and slow down and appreciate each season’s unique influence on the land. This modern farm in Cambridge, Vermont is an ideal place to roll up your sleeves, its assembled buildings a harmonious combination of contemporary and historic. The sprawling 270 acres of land means there’s plenty of room for other horticultural projects, including beekeeping and tending the property’s fruit-bearing trees. As any businessperson knows, there has to be passion behind a project to make it work—especially when it comes to owning a vineyard, which can be a huge undertaking for even the most financially savvy. But owning a vineyard ensures your career doesn’t overtake your aspirations. Meld your life’s work and your enthusiasms with an estate like this tastefully-French-inspired home in California’s Napa Valley. With a bright, well-appointed main house, .75 acres of planted Cabernet Sauvignon vines, and 1.75 available acres in the Rutherford dust, it would be hard not to feel a thrill when considering the potential of this property to make your passions come true. With the space that a vineyard affords, not to mention the breathtaking views, who wouldn’t want to tap into their inner host sensibilities? In addition to welcoming friends and family into your vineyard undertaking, owning a winery presents the opportunity for larger events—like weddings, where vineyard settings are a trend on the rise. From a business perspective, it’s beneficial to open up your vineyard or winery to the public—the exposure will not only help sell the wine you’re producing, but encourage others to hold events in your space in the future. The family-run Averill Creek, a 46-acre winery in Duncan, British Columbia, is built into the side of Mount Prevost and can host 100 guests at a time. Complete with a tasting room and bistro, Averill Creek and its Pacific Northwest surroundings are the ideal locale for any number of elegant nights. Every vineyard has a story to tell—some older than others—and this rich history can be one of the most enchanting parts of making one your home. Whether the estate itself has been around for centuries or the surrounding locale is ripe with timeless charm, the life of a vintner can be deeply connected to history. Step onto this venerable wine estate in Western Cape, South Africa, and you’ll immediately feel the pulse of stories past. Dating back to 1709, with upgraded renovations 10 years ago, the Grand Dédale Country House features a library and tea lounge, as well as a large veranda overlooking the 86 acres of planted vines on the property. House additional guests in the property’s separate thatched cottage, and cap off your night with a glass of Cabernet Franc next to the picturesque saltwater pool. While the reality is that owning a vineyard can come with its fair share of challenges, the perks may be worth the effort. Vineyard life is about more than wine: it can be a rich communal experience and a venture with many stories past—and future—to be told. Read to take the plunge into vine ownership? Find your acreage from among these premium vineyard listings, and you could soon be bottling your own bespoke vintage. The Los Espinos Golf Course is the only absolutely private and exclusive golf course in Chile, and is perfectly maintained. The course was conceived, designed and built by the great Chilean golfer Mario Kappés Ramsay in 1992. It has 18 holes and offers approximately 6,400 yards long playing off the blue tees, and 7,000 yards long playing off the blacks. It is a par 72 course situated among hills, forests and gullies and is surrounded by different varieties of almond trees, which are splendorous when in bloom. Its landscaping is outstanding; it has different species of trees such as the “Espino”, indigenous “Maiten” and “Boldo” trees, American Oak, Cedar, Bald Cypress, Beech, Red Australian Eucalyptus, Fir and Holm Oak. Between the 11th and 13th holes the is a cactus garden with over 100 species of cactus. The 55-hectare course is hybrid dwarf Bermuda grass. The greens, tees, fairways and roughs are cut to different heights. The course was built over the natural relief of the land, which was adapted to the golf course, conserving most of the area”s natural environment. The main house covers 670 square-meters of Georgian architecture, and is located on a rise that provides spectacular views of the golf course. Today, we’re happy to announce Leading in Luxury, a channel in partnership with a brand that understands the value of that reputation; Inman, who serves as the trusted source for real estate industry news, will host this exclusive section on trends, best practices, and innovations in luxury real estate. Sundays are sacred. Whether you spend the day exploring local art and architecture, browsing market stops, or indulging in culinary delights, there’s no denying the seventh and final day of the week is reserved for discovery as a ritual. This Sunday, we explore the best of Toronto. Elegant brick homes, lush gardens, and old-world charm can all be found in the center of Toronto. Known for its distinctive tower and the critically-acclaimed, star-studded Toronto International Film Festival, the city holds top spot as Canada’s most populated metropolitan hub. The Annex and Yorkville neighborhoods, home to families and students alike, are bursting with some of the best international cuisine, cultural institutions, and boutique shopping the city has to offer. Take your cues from the locals and spend a perfect Sunday wandering Toronto’s streets. For an iconic Toronto experience, wake up in one of the spacious brick homes that make the area so idyllic. This restored “Annex Style” home on Madison Avenue features a large covered entry and a formal living room, complete with gas fireplace, antique wood mantle, and marble surround. Start off by preparing a coffee in the state-of-the-art kitchen and step out into the private courtyard for a moment of tranquility before heading out into the bustling city streets. When it’s time to sally forth, you’ll be right in the thick of things. Venture to the Four Seasons for breakfast at Café Boulud, where chef Daniel Boulud serves up seasonal dishes in the French tradition. Drift down to Bloor, where Hermès, Gucci, and Burberry await, and pop into altheisure label Kit and Ace for a flat white from Sorry Coffee Co. For boutique shopping, there’s Corbò Studio with its edited collection including J Brand and Diane von Furstenberg, and Montréal family business ça va de soi for reinvented knitwear. When you’ve wrapped up your browsing, take the half-hour walk to Casa Loma, a castle in the heart of the city. Built in 1911 by businessman Sir Henry Mill Pellatt, the castle was dreamt up as a private home before financial difficulties plagued Sir Pellatt and the city took ownership in 1933. Now open to the public, Casa Loma offers visitors the chance to wander the grand 98-room castle and its surrounding gardens. Having had your morning fill of history, turn your thoughts to food. For lunch, there’s Kasa Moto, with its notable sashimi and nigiri, or well-crafted bites at Chabrol for those in search of pork liver mousse and apple tartes. Midday constitutionals can be had in nearby Queen’s Park, where Ontario’s government buildings take pride of place alongside the stately architecture of the University of Toronto’s downtown campus. Start your afternoon with a visit to the Royal Ontario Museum. The country’s most-visited museum, the ROM has an extensive collection of natural historical artifacts from Canada and around the world. Or dash across the street to the smaller Gardiner Museum, where a focus on clay works is punctuated by special exhibitions, lectures, classes, and an in-house artisanal gift shop. Needless to say, it’s easy to spend hours with art, but be sure to give yourself a much-needed pause for a late-afternoon cocktail at nearby Bar Reyna, where classics like the Negroni share the menu with inventive updates like the Basil Cognac-O-Lada. No evening in Toronto is complete without a visit to the Royal Conservatory of Music. An acclaimed educational institute, the Conservatory also offers a full calendar of concerts and performances in the contemporary Koerner Hall. After you’ve been inspired by the musical stylings of some of the world’s best performers, satiate your appetite at Blu, named one of Canada’s 100 Most Romantic Restaurants in 2018. The intimate atmosphere, live piano music, and extensive wine lists are matched only by the delicious, award-winning food—a perfect way to cap off a day of purposeful wandering. No matter where your Sunday takes you, Toronto is sure to offer up cultural and culinary delights, leaving you looking forward to your next weekend in Canada’s star central city. If your Toronto visit turns into a lifelong love, find your permanent residence from among these elegant homes, and ensure that the best of the city is always at your doorstep. From an elegant stone residence in Quebec to an exclusive penthouse in Seattle that inspired a cultural phenomenon, these are this month’s four featured notable properties for sale. This “mansion in the sky” enjoys 2,000 square-feet of spectacular terraces overlooking Park Avenue along with 6,000 square-feet of magnificent interiors in this enormous mint-condition duplex in a premier full-service condominium building. The apartment is characterized by distinguished architectural details, beautiful hardwood floors, and high ceilings. Included in this offering is a separate studio apartment on the third floor, perfect for staff or guests or as a private home office. This penthouse’s cover area of 21,294 square-feet includes five bedrooms. Modern and sleek, this residence features panoramic views and grand beach-facing views, including the Dubai skyline and Burj Al Arab. Amenities include lush gardens, gym, spa, VIP lounge, private jetty, landscaped terraces with Jacuzzi and infinity pool, and cinema. ONE PALM is a limited collection of 90 ultra-exclusive homes, designed for a life lived in uncompromising abundance. Showcasing unrestricted harbour views second to none, this masterfully architect designed home offers an abundance of remarkably detailed and appointed living and entertaining areas. Recently painstakingly renovated and taking luxury to new heights, the home features six bedrooms, a large office with separate security entrance, private gym, air-conditioned wine cellar, a self-contained one-bedroom guesthouse and boating facilities. The structure of the guest house had been largely preserved during the renovation to reflect the original design, concept and appearance of the property. The legendary “Palais Maeterlinck” has been transformed into 18 prestigious high-end residences facing the Mediterranean. The seafront estate offers privacy, security and breathtaking 180° views of the Mediterranean. Its residents have the exclusive option to have their private homes custom-designed and furnished by one of the world’s leading names in luxury lifestyle: Ralph Lauren Home. The property encompasses more than three hectares of landscaped grounds, including a formal park with gravel paths, and decade-old cypress trees. The estate’s main swimming pool, one of the largest in the French Riviera, is flanked by 20-meter tall Greek columns. Whether it’s a modern architectural marvel in Colorado or an esteemed historic estate in Italy, discover homes new to market from around the world.